GANGNEUNG, South Korea -- Ecstasy, heartbreak and a crash. Kind of sums up the American ice dance experience at the Winter Olympics. 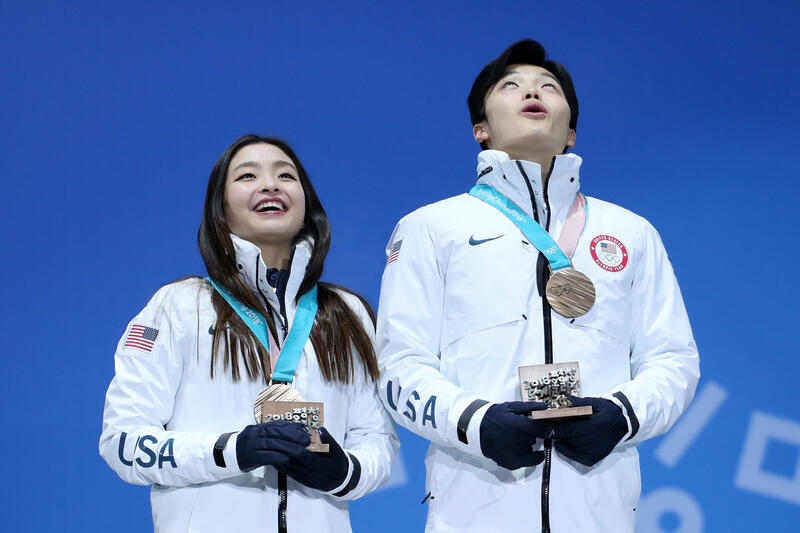 The Shib Sibs - Maia and older brother Alex Shibutani - added a bronze medal in the event to their team bronze early in the Pyeongchang Games. U.S. champions Madison Hubbell and Zach Donohue made two key errors in their free dance and slid from third to fifth place. Madison Chock and Evan Bates had an even bigger slip-up: the rare ice dance fall. Still, a third, fifth and 12th with a major mistake should not be underplayed. "It's great for us and it's great for Team USA," Maia Shibutani said after they moved up from fourth place and held off a Russian couple to give the United States a podium spot for the fourth straight games: a gold, two silvers and a bronze. After the medal-winning performance, she tweeted that the pair "just had the best skate of our lives!!!" So proud! No matter what. @AlexShibutani and I just had the best skate of our lives!!! "It feels like gold," Alex Shibutani added. "It's unbelievable." "It's such an honor to represent your country in the Olympics, and our sport is such a strong event, as you saw from the marks," he said, noting that the top two duos - gold medalists Tessa Virtue and Scott Moir of Canada, silver winners Gabriella Papadakis and Guillaume Cizeron of France - set world records Tuesday. "It's amazing to have that Olympic moment we dreamed of." The Shibutanis also believe their performance could lead to more siblings and more Asian-Americans in ice dance. Alex noted how rare each combination is. "We had no path to follow," he said. "There was no blueprint for us. (Coach) Marina Zueva had no experience with siblings or Asian-American ice dancers and we had to discover by ourselves our own path." That path led them from ninth place at the Sochi Games to two U.S. championships. They also have three world championships medals. And now, an Olympic jewel. "It's really been a leap of faith we had to take," Maia Shibutani said. "We really have discovered we need to be ourselves." Added Alex: "We found we needed to not play characters but to be Maia and Alex." He is 26, she is 23, and they didn't want to look ahead to another Olympic go-round. But Hubbell and Donohue made it clear they aren't through; he is 27 and she soon will be. Hubbell's eyes were wet when she spoke about the rough go in the free dance. They had been perennial third-place finishers in America before making a huge leap this season, winning their first national title. They believed the Pyeongchang Games would be their special moment. Then they made two errors in the free dance, one early and then a late stumble by Donohue. "At this moment, we are disappointed and frustrated," Hubbell said, "because this was not close to our best. At this level, you cannot afford to make mistakes against this type of competition. "But we will build off this and not allow this to be our legacy." Donohue admitted he wasn't as mentally sharp as he needed to be in such a pressure-cooker atmosphere. He looked back at last year's worlds, when they hoped to compete for a medal and wound up ninth. "Every experience brings a piece of information we didn't have before," he said, noting the couple would pay extra attention to their mental approach as they prepare for next month's world championships in Milan. Chock and Bates didn't want to look beyond Tuesday. They were the only ice dancers to have a fall in the entire competition, and it came as they were preparing to do a combination spin. Their blades clicked just as he was bending down and she was beginning to spin. "It's impossible to do the spin with our feet attached," Bates said. "We were too close together," Chock explained. "It's a moment we wish we could have back," Bates added. "It's a mistake that has never happened in training before, ever. There's no explanation." Chock and Bates also didn't want the fall to take away from the message they were trying to convey while skating to John Lennon's "Imagine." "We hope we got the message of peace across," Chock said as she wiped her eyes. "We think the audience understood."